Hello and welcome to Raring2go! 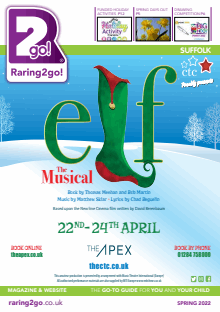 Suffolk the definitive guide of what to do and where to go for families this Spring! My favourite time of year, with longer days and flowers coming into bloom. Let us hope this Easter is kinder to us weather wise than last year, especially with lots of outdoor activities to enjoy. Do save a date for the various agricultural shows that are on offer throughout Suffolk, always a great family day out. Are you organising or attending a local event, fete or fair? Why not upload your details here to the website for all to see? The event page is regularly updated as well as our Facebook, Twitter & Instagram pages. Also to save money click here and download these great money saving vouchers. Please call me on 07841 337054 or email at emily.parker@raring2go.co.uk to get in touch with comments, suggestions or if you would like to consider Raring2go! as part of your marketing plans for the coming year. Easter Quiz Trail at Landguard Fort from Saturday 6th to Monday 22nd April. The 95th Rifles on 13th & 14th April.